FROM THE US OPEN — There have been few players like Roger Federer when it comes to inspiring the kind of lyrical praise and glowing adjectives his game regularly receives. Even a casual onlooker just needs to glance at the 19-time Grand Slam champion on a tennis court to know they are seeing something special — the elegant strokes, the feline movement, the way a swing of the racquet can instantly transform the regular into something exceptional. It is a seamless blend of the athletic and the artistic, forged within the intense, swirling midst of competition. Yet for all the broad appeal of Federer’s game, the players who watch him just as avidly as fans know there is even more in the details. To their trained eyes, it is the little things — a step here, a racquet turn there — that imperceptibly add up to a champion’s repertoire. What is equally striking is that each of these players, asked to identify a subtle feature of his game, selects something different. It begins from the moment Federer tosses the ball up to start the point. “It’s very tough to read his serve, because the toss goes in different directions,” said Mats Wilander. Players typically throw the ball up in slightly different positions depending on whether they want to slice, kick, or hit the ball flat in either direction, often allowing opponents to guess their intentions. 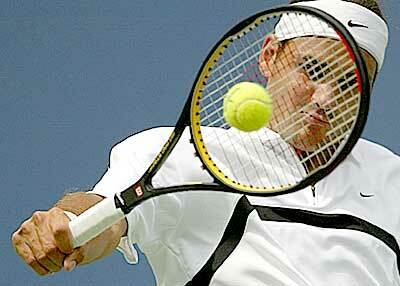 Pete Sampras was famous for being able to disguise his delivery by always tossing the ball in the same spot. But Federer can throw the ball a particular way and then hit it another. “This is next level,” said Wilander. On top of that, Federer’s serving — on a good day, anyway — is also the most precise on tour. While most players place the ball a couple of feet inside the box, Federer can consistently keep within a foot of the lines. That helps explain why, despite a delivery that rarely ventures above the low 120 mphs, his winning percentages are similar to the giants serving in the 140-mph range and he has the third most aces in ATP history behind Ivo Karlovic and Goran Ivanisevic. Even on other shots, it’s not much easier to tell where Federer is going. Germany’s Mischa Zverev is among the very few players on tour still serving and volleying, and he relies on his ability to anticipate where the other player is going next. Except when he’s playing his idol. “Federer takes almost every ball on the rise, which takes time from you, especially if you try to come in,” he said. “And the other thing is, he can position his feet the same way for down the line, for crosscourt, and for a lob. So that gives me no chance to read where he’s going, where with most other players, I can — based on how they position their feet on the court — if they’re leaning into the ball, if they’re leaning back. Zverev might be a Federer fan, but he can’t exactly say he likes playing against him. “I always feel like I am an amateur, and I have no clue what to do,” he said. Other aspects of his swing and footwork also elicit admiration. As Federer strikes the ball, his arms and legs move in choreographed tandem, assured in their balance and timing. It all helps to produce the symphony of shotmaking that has become Federer’s signature. Most famous are the attention-grabbing crowd-pleasers like the “sneak attack,” the tweener, the dropshot and the high backhand smash. Admittedly, there can also be more than few shanks on off days. But even seemingly standard shots reflect an unusual amount of talent. “He plays low-percentage tennis,” comments Nick Kyrgios, astutely, knowing a few things about low-percentage tennis himself. Unlike the more volatile Kyrgios, though, Federer can hit such shots consistently and under pressure. That, Tim Henman has suggested on BBC, is because Federer adds “margin” — like by putting topspin on his trademark crosscourt angled forehand so it curls high above the net, allowing him to do it again and again. Simona Halep especially likes the way Federer moves his feet when running around his backhand to hit the forehand, calling it “efficient” in its motion and positioning. And while his one-handed backhand is not as big a weapon as the forehand, it has admirers of its own. Since Federer returned this season from an extended layoff following knee surgery, the talk has been largely of his topspin backhand, which he is hitting more often and offensively than before. But some pick the standard version as his most effective shot off that wing. Federer possesses five types of backhand slice, according to Santoro. There have also been measurements that suggest he can carve the ball more than any other player. There is plenty more to pay attention to: his anticipation, his touch, his variety. Watching Federer has become something of a collective exercise within the game. But for a lot of pros, his conduct is just as remarkable as his play. Whether it’s on the court or off, fellow players see a lot in Federer.